Marvel has regained control (at least partially) of the Spider-Man film franchise and The Blot has super high hopes for their first Spidey film, Spider-Man Homecoming! 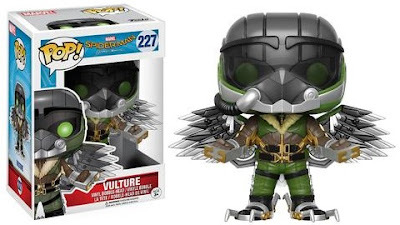 To correspond with the film’s release, Funko is dropping a really fun Spider-Man Homecoming Pop! Marvel Series, which includes Spider-Man, “Homemade Suite” Spider-Man, Peter Parker, Tony Stark and the evil Vulture. Interestingly enough, this might just be our very first Tony Stark Pop! without any part of his Iron Man armor. 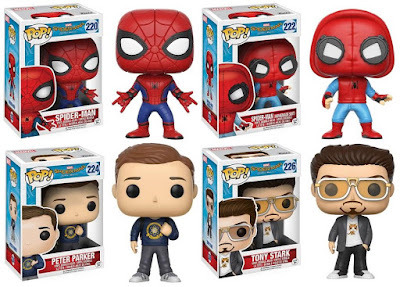 Each Spider-Man Homecoming Pop! bobble head vinyl figure stand 3.75” tall, features one point of articulation and come packaged in a full color displayable window box. These Marvel figures can be pre-ordered now at Entertainment Earth for $10.99 each here.